Applesauce hardware, AC/DC power adapter, sync sensor cable, sync sensor and magnetic strip. If you are missing any of these items, please contact us using the contact form on this website. 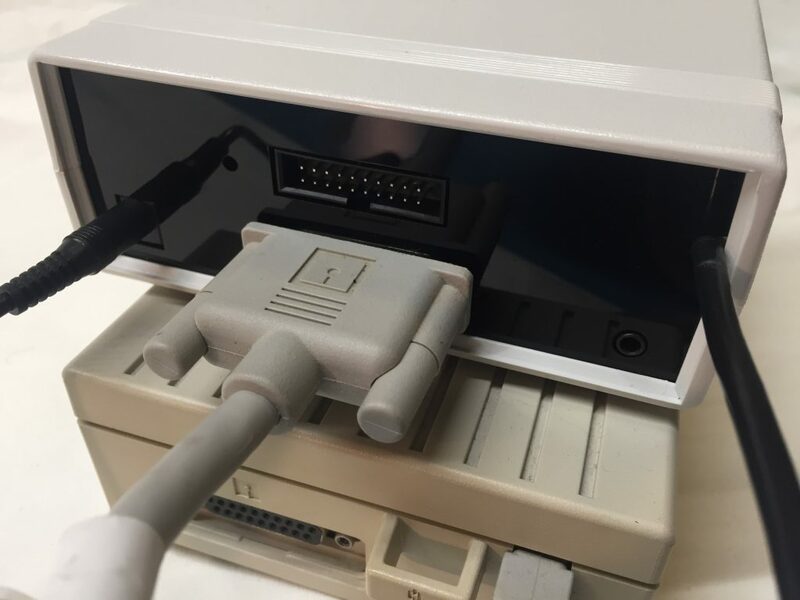 If you have a real Apple ][ machine handy, it is great to start out by connecting the drive up and making sure that it can successfully boot disks. 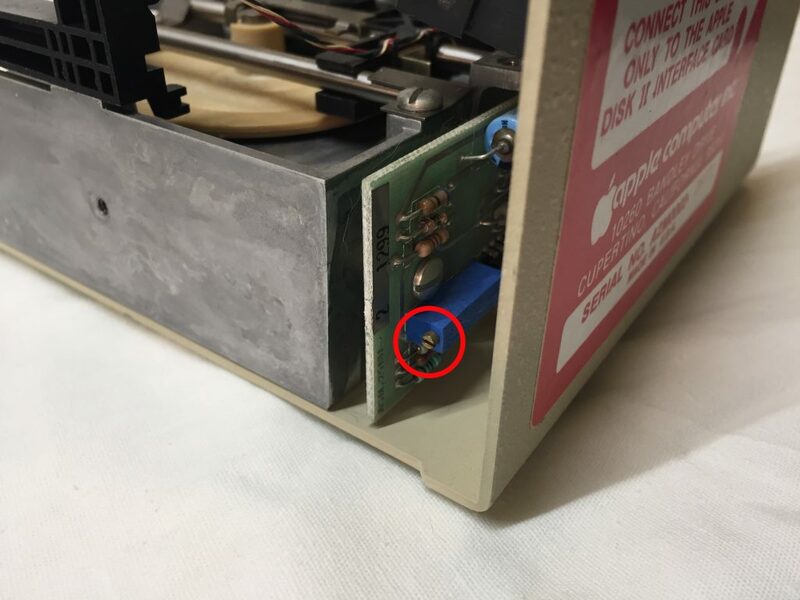 The 74LS125 chip within the floppy drive behaves as a fuse when the ribbon cable is connected improperly. Unfortunately, this can be a fairly common thing. When connecting cables to your Applesauce, be sure that the USB cable is always disconnected. Also remember that only one floppy drive at a time can be connected to your Applesauce. 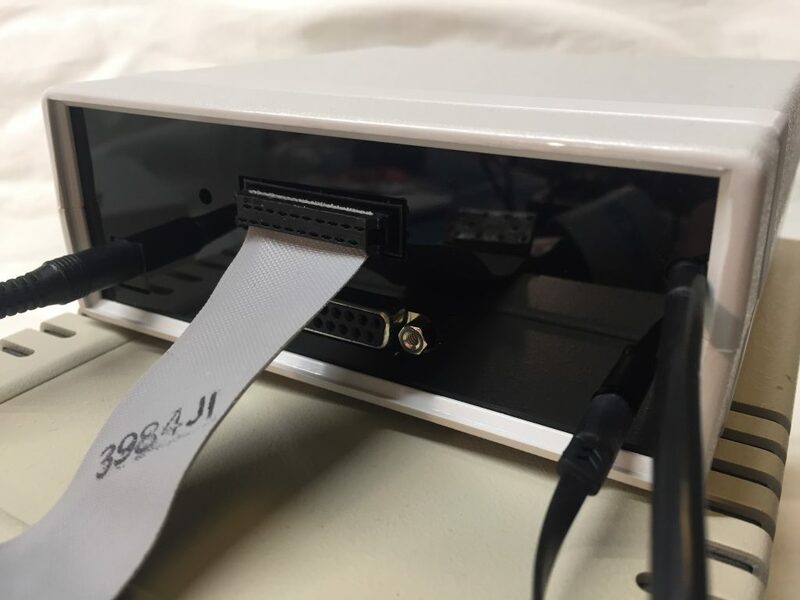 The ribbon cable from the Disk II should be facing down when attaching to your Applesauce as pin 1 (red stripe on the ribbon connector) is on the left side. Connecting the cable upside down can result in damage to your Disk II drive! The power adapter plugs into the left connector and the sync sensor into the right connector. The Applesauce client software is available for download here. When your Applesauce is plugged into the USB line, it will go through a quick startup sequence and then wait patiently for the client software to initiate a connection to it. While it is waiting, the LINK light will be flashing green. When you start the client, it will connect to your Applesauce and the LINK light will glow solid green. On later runnings of the client software, you may encounter the auto updating mechanism of the software. In order to keep your software and hardware up to date, the software will check for updates and allow your to download them automatically. The software also has the ability to update the firmware of the Applesauce hardware. If such an update is required, then you will receive a message when starting the software. For our first image test, it is best if you have a known-good and unprotected floppy to try imaging. Something like the Apple DOS 3.3 System Master or such would work great. 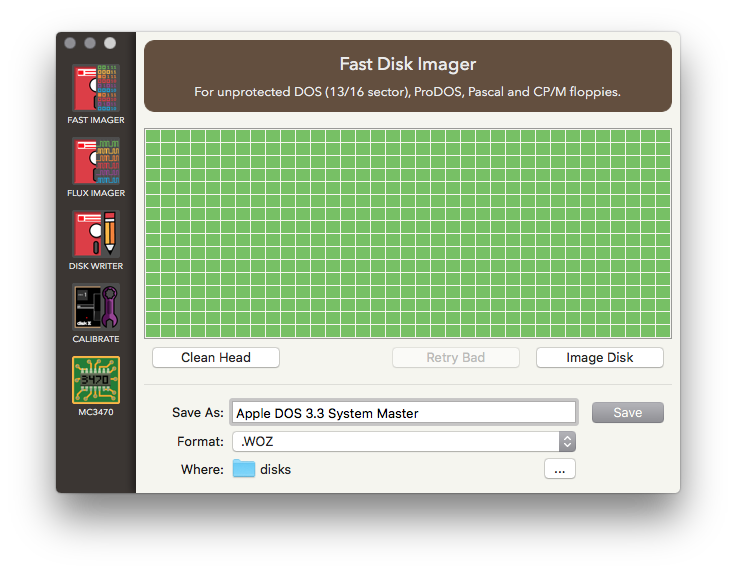 From within the client software, you can select the Fast Disk Imager. Press the Image Disk button and you will hopefully see a completely green grid as shown below. The blocks represent all the sectors on the disk, and green ones indicate that the sector was successfully captured. If you have red blocks, then this may mean that your drive is either not connected properly or that you may need to clean the drive head. 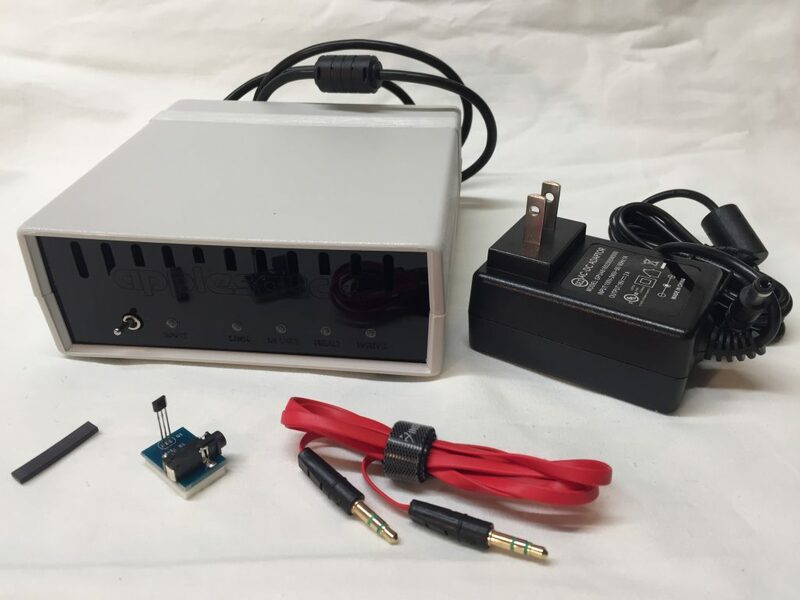 A sync sensor is required for Flux Imaging of 5.25″ floppies. It is a straightforward process, but can vary quite a bit depending on which model of Disk II you have. Therefore, there is a dedicated section that goes into detail about this step here. With the sync sensor now installed, go to the Calibrate screen within the Applesauce software. Click the Speed Test button. If the sync sensor is successfully detected, then there should not be a message box that pops up asking you to insert a scratch disk. If you do see the message box, then unplug the USB cable to your Applesauce and make sure that the sync sensor cable is firmly plugged in on both ends. Some cable and jack combinations are tight and might require a bit of force to make sure that it is seated properly. While you have the Speed Test running, this is a good time to also set your drive speed. The ideal speed is 300rpm. You can use a small screwdriver to adjust this potentiometer to change the drive speed.